Diamond Emerald Ring. 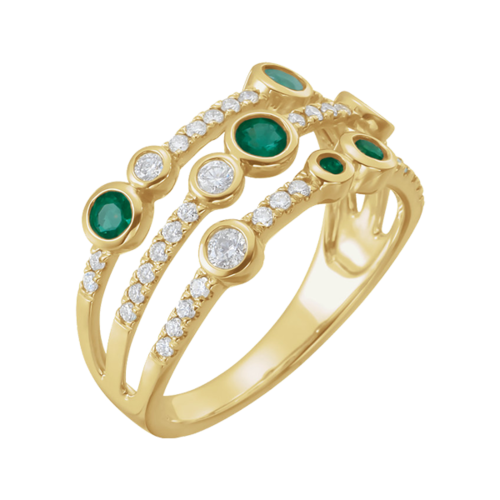 Stunning 14k gold set with 3/8ctw diamonds and about .40ct Emeralds. Ring measures 21mm across the top. Diamonds in this ring are I1 G-H color. Vibrant 14k white gold Emerald and diamond ring. Genuine oval Emerald is .20cts and surrounded with .20cts SI1 clarity H in color round diamonds. Emerald and diamond ring is a petite design. Gorgeous White gold Emerald and diamond ring. 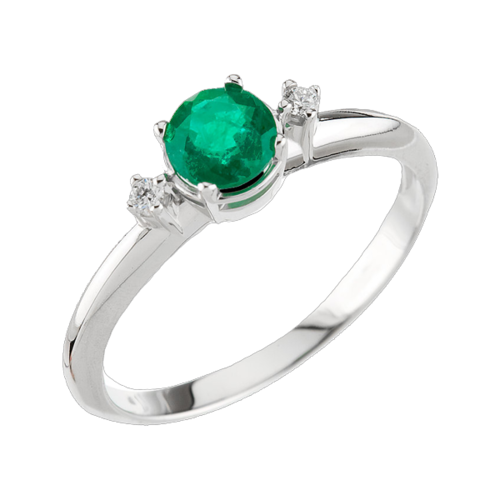 Genuine 7.5x5.5mm oval Emerald is the focal point in this beautiful ring. Oval Emerald gem is a full 1 carat stone and surrounded with round and baguette diamonds. The diamonds are SI 1 clarity G-I color and total 1.24 carats. You'll love this finely crafted style that transcends time. We're happy to size this ring but size items are custom and non returnable. 14k Two Tone Emerald and diamond ring. 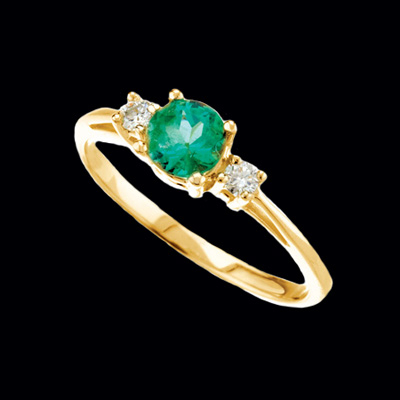 Lovely yellow gold curves around either side of this vibrant Emerald center. Emerald measures 4.8mm round and weighs .46ct tw. Emerald is set in a half bezel style setting and accented with with .09ct channel set diamonds. We're happy to size this ring but size items are custom and non returnable. Incredible 14k white gold wide band set with princess cut genuine Emeralds and surrounds by .42ct tw diamonds. Emeralds measure 3mm square each for a carat weight of .77ct. This white gold band tapers from the wide top to a narrower width at the back of your finger. 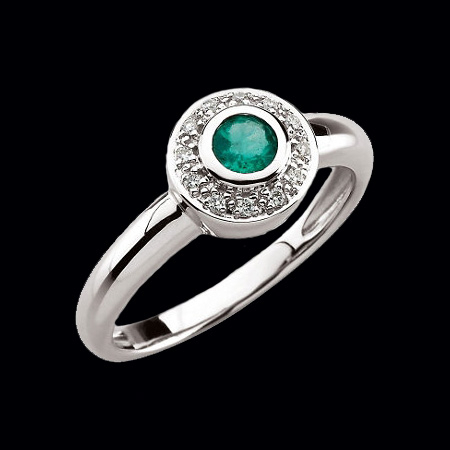 You'll fall in love with this beautiful emerald and diamond ring. Stock Size: 6 We're happy to size this ring for you, sized rings are considered custom and non returnable. 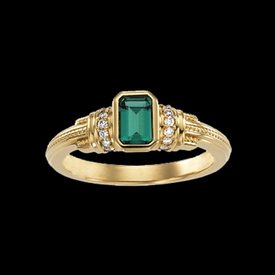 Gorgeous Emerald, 14k Gold, and Diamond ring. Emeralds measures 5x3mm and are emerald octagon step cut with accent diamonds. Diamonds total .07ct tw and give these lovely emerald a little kick. Crisp brite 14k white gold set with a 1/4ct genuine Emerald then surrounded with a diamond border, that's our Round Emerald and Diamond ring. Diamonds are round and total .06ct tw, a dainty accent to the vibrant emerald center. 14k White gold set with an emerald cut Emerald and diamond accents. A traditional design with a nice 7x5mm emerald and 1/6ct tw round diamonds. Great quality ring. 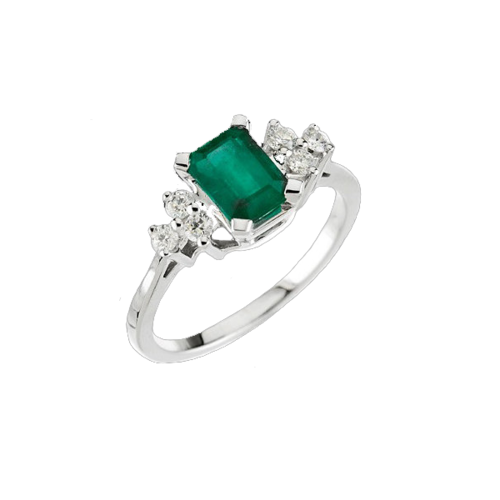 Vintage design 14k Yellow or White gold is set with an Emerald cut genuine Emerald measuring 6mm x 4mm oval aprox. .56ctw. Accent diamonds on either side total .11ctw. Beautiful Ring. 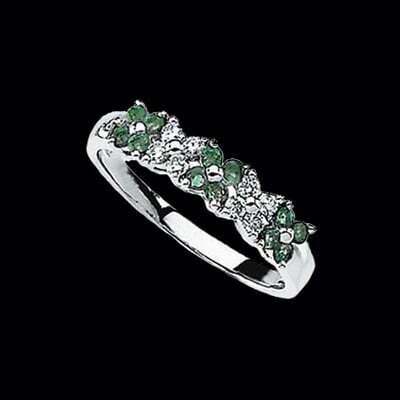 Lovely 14k White gold ring is set with Emeralds and Diamonds in a flower design. The genuine emeralds total approx.. .29cts and diamonds total .20cts. Very pretty ring. Pretty genuine Emerald and Diamond ring. This ring is set with a 5.2mm round and is an A grade gemstone. Diamonds total .08ctws. This is a really nice ring. 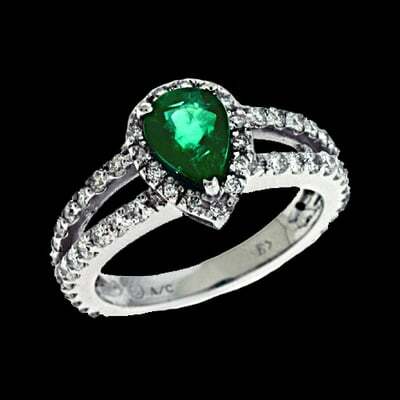 Gorgeous 14k White gold Pear shaped Emerald and Diamond ring. This genuine Emerald is a 1 carat pear shaped great color gem. Diamonds in this ring are SI 1 clarity G in color and total .94ctw. Simply gorgeous ring.